Hey mazzie's mean-girl gang! Read more about the exciting antics of you and your fellow Social Justice Warriors here! In addition to being the social media darling of the Left, and an unethical journalist, Mikki Kendall must have the most amazing case of lack of self-awareness ever - probably a good thing if you're a demagogue. I've never been able to communicate directly with Kendall about her Google-bombing smears - she did not provide contact information on her Tumblr account. Not that it would have done any good - if I had complained directly to her I have no doubt she would have doubled-down and Google-bombed me even further with her smears. So it's funny that she would say "you can't get logic through, or facts" since I've never had direct communications with her. But you don't get to communicate with Kendall - she smears you and you can just STFU and take it, forever, as her smears appear in your Google results year after year. It's only thanks to Twitter having such an open-door policy that I've had this much communication with Kendall, after she initially smeared me three years ago. As the Nation article points out, Kendall has a family and graduate studies - and in spite of this she appears to spend almost every waking minute tweeting a combination of mundane trivia about her life and attacks - most often against unnamed enemies. But because I chose to devote a series of blog posts to Kendall's disgraceful career... but really, you can't expect fairness from extremist demagogues - they cannot fathom the concept. 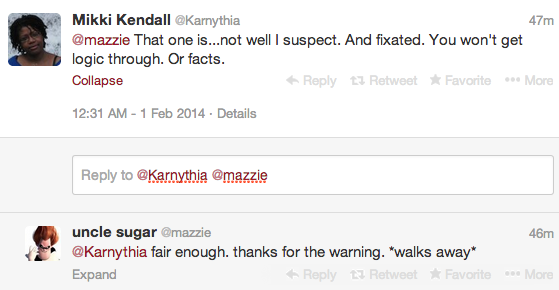 "uncle sugar" or @mazzie is such a devoted Social Justice Warrior that she even out-Kendalled Kendall by blaming white feminists for the Patriarchy. And her tweet, about white feminists writing "hit pieces" is a reference to the Nation article.